Here is one of the most interesting radio sites in our network. Our Hope site offered the biggest challenge in antenna design. Antenna heights: 1507 - 1525m or 4944 - 5003 feet above sea level. 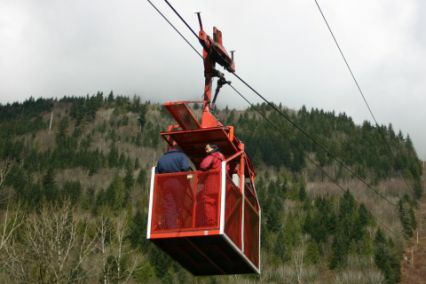 Before you can begin your trip to the top, each person must be equipped with a survival suit in the winter and a harness in the event the tram fails and you must exit via the floor hatch to the ground below. There are three towers at the Hope site. 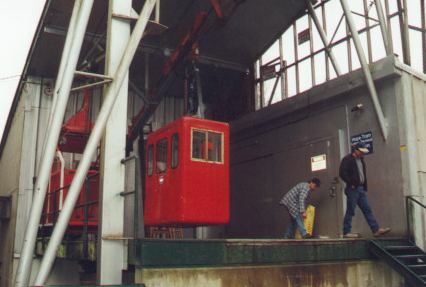 The first is just as you approach the upper tram terminal. 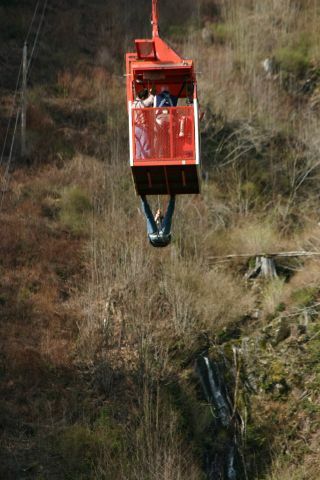 This would be at an altitude of 1509 meters or 4954 feet above sea level. 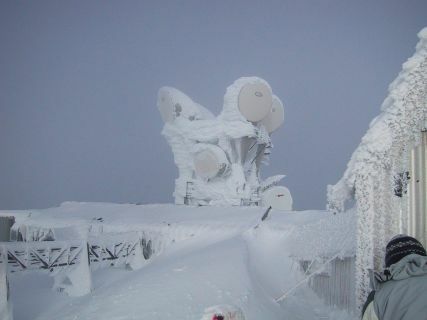 This site has some of the most severe weather conditions for a radio site in North America. 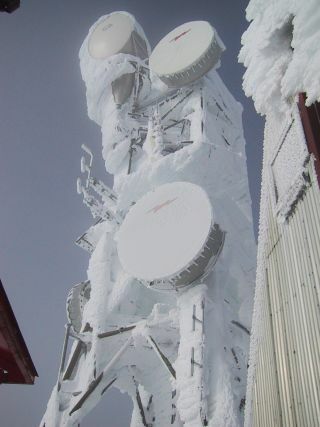 Each tower and antenna structure had to be constructed to meet the severe wind and ice loading conditions that exist here. The icing is so bad here because warm moist pacific air is forced to climb over this first mountain range here on the West Ccoast. As this air cools it freezes instantly, helped by the strong winds that blow across the top. In the photograph above is an excellent example of the special protection that has to be installed over top of the microwave antennas. 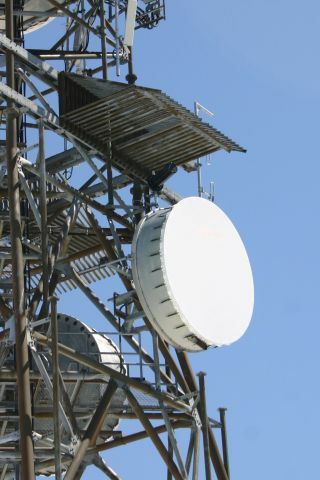 A steel grate ice shield is installed above the dish so that any ice that might fall from higher up the tower will strike the grate and break up into small pieces and hopefully not harm the dish. Antennas with no over head structures can stand unprotected. It was a crisp winter day when these pictures were taken. The conditions you see here are pretty average compared to what is normally experienced on this mountain site. What you are seeing on the tower is known as hoar frost. This is generally not a serious condition. The ice will shed as the temperature changes and the sun comes out. 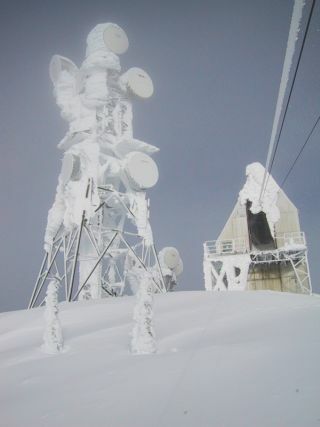 During normal winter days the tower and antennas may have up to 12" of frost and ice on them. Combined with the wind, all this excess weight causes many antennas to fail. It can also cause coax and waveguide to be crushed, or pulled out of connectors. Falling ice is also a severe hazard and causes all kinds of damage. 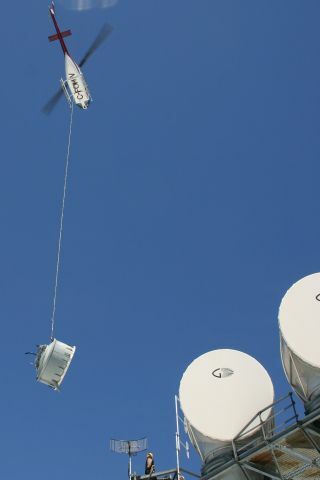 Just above the microwave dish you will see a little black radome enclosed antenna. 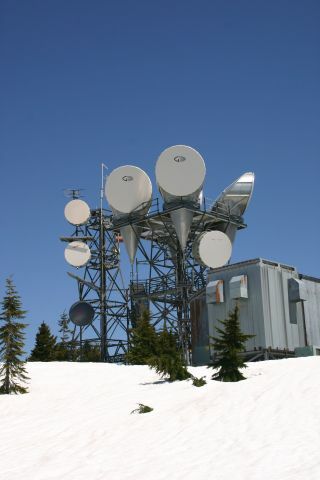 This is the SRL307RCHD antenna that connects to Ryder Lake. 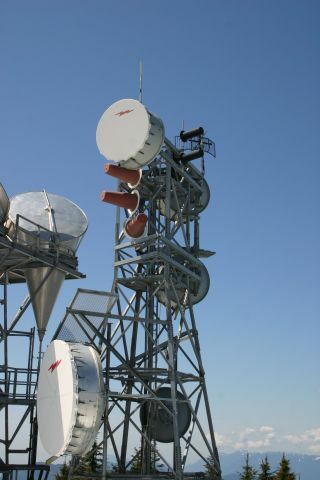 It is a helical UHG Yagi that is enclosed in a fiberglass radome to protect it from ice damage. 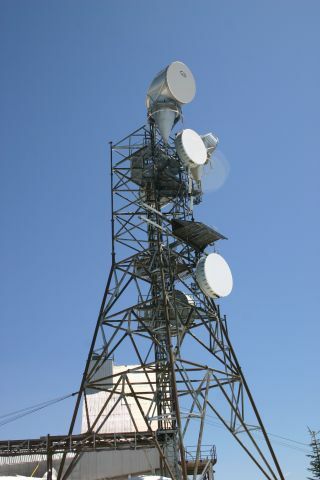 The two stacked helical array antennas are the two black cones located at the top right side of the tower. One of them has since been removed, since one antenna was found to be bad (wet). These are the antennas that face Promontory. 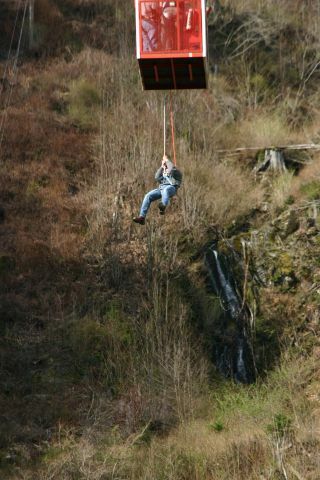 This is how you install/remove antennas when there are no roads to the site. Here you can see that Hope has the simplest rack design. Since there is no UHF repeater, the space needed was much smaller. Only a WR-155 radio and Tiny 2 TNC (modem) is available for users. Two Harris UHF radios below carry the network onto the next site. 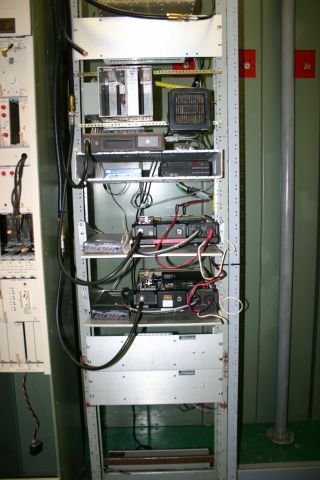 DC-DC Converters connected to the -48V battery plant supply power to the equipment, ensuring uninterrupted service. Because of the valuable location of this site, we share our VHF drop antenna with a APRS digipeater (callsign DOGMTN) on the national 144.390MHz APRS frequency. Again, this site like all the others is seismically hardened and backed up with emergency power. 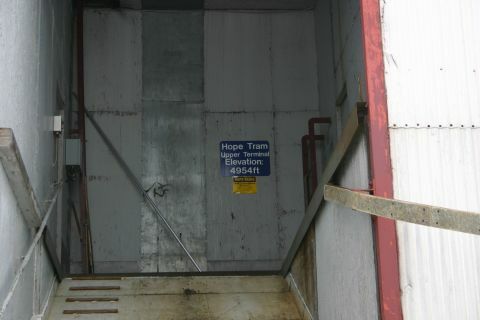 Our Hope site covers Hope, the Fraser Valley East, and parts of the Coquihalla Highway. 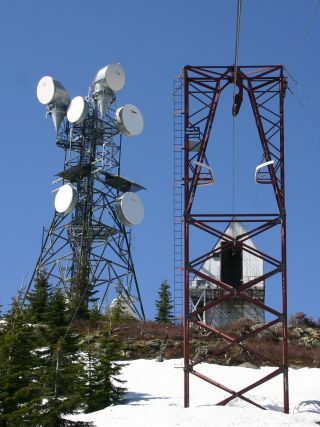 It's signal can be heard in parts of Vancouver and Southern Vancouver Island. 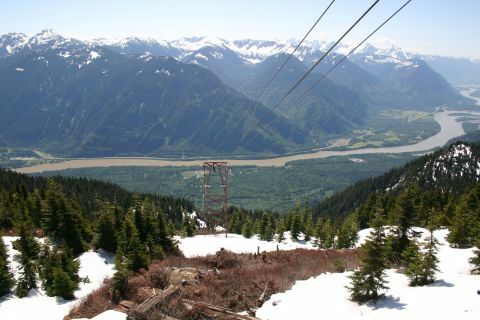 This is a great photograph of the east end of the Fraser Valley and the Fraser River. 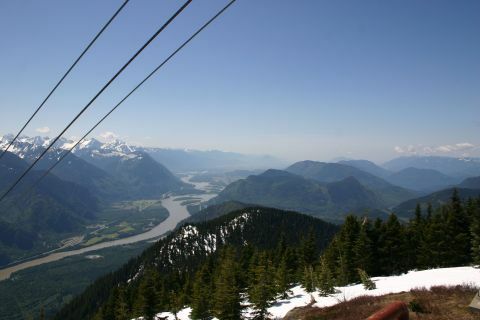 Looking directly South from the upper tram terminal you can see the Fraser River. Across the river is the Trans Canada Highway. From this spot on the Highway you can see one of the towers.